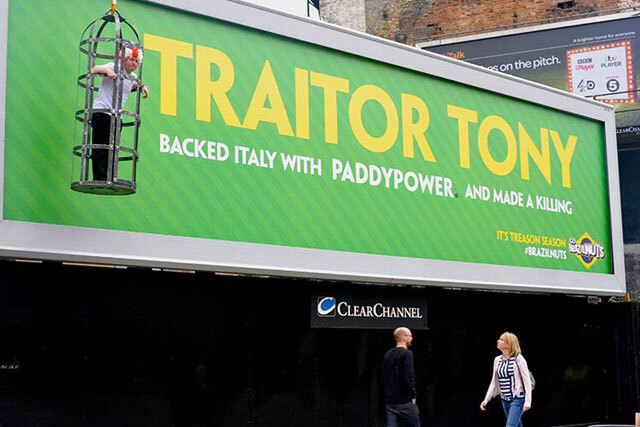 Paddy Power has continued its tactical World Cup campaign with a special build billboard featuring a caged "traitor" who had bet on Italy beating England on Saturday. The activity involved locking up the man, called "Tony", in a gibbet (a type of cage used to imprison traitors, murderers, highwaymen, pirates and sheep stealers in the 18th Century) that was hung from a billboard. The billboard said: "Traitor Tony. Backed Italy with Paddy Power. And made a killing. It’s treason season." The campaign was created by Joe Bruce and Kate Baker at Crispin Porter & Bogusky. Paddy Power’s media agency is M2M. The innovations team at Talon Outdoor worked with Clear Channel’s Create division to produce the special build within hours of Italy beating England 2-1. The special build was designed to complement the bookies’ TV campaign. Paddy Power is also encouraging people to take a photo of themselves with the billboard (a "selfie") and post it on Twitter using the #Brazilnuts.